Any holiday is busy with church and travel and family so it’s hard to coordinate the fun and have fun yourself. For Easter this year I decided to schedule an early brunch for our family at a lovely restaurant. This way everyone had time to relax in the afternoon. At 6:00 pm we all convened for an Easter egg hunt for the children, a sandwich platter and age appropriate drinks for all. Here is a plan that will get you out of the kitchen and into the mix. – Mother’s Day – have the big kids coordinate a card making party for all of the moms. Think glitter and macaroni. – clothing drive – ask everyone to bring one no longer loved professional outfit to the party and box them by gender and size. Donate them to a job placement center. – game night – you don’t have to stick to the usual ones…have you ever played Candyland with alcohol? 2. A Bite: I made a sandwich platter. I bought 2 ciabatta loaves and 2 multi grain loaves. Look for bread that will lay flat on both sides when cut in half. I cut one ciabatta and one multi grain in half lengthwise. I put mayo on both sides and layered a quarter of a pound of provolone cheese, a half a pound of thinly sliced roast beef and sliced tomatoes. I cut the sandwich in quarters then down the middle making eight sandwiches. Next was prosciutto di parma on ciabatta: i spread pesto on both halves of ciabatta then added a half a pound of thinly sliced prosciutto di parma. On that I spread about 6 ounces of goat cheese. I cut the sandwiches as described above. 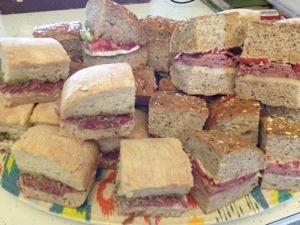 I placed all of the sandwiches on a big plastic platter. Paper plates and paper napkins save time and add to the party theme. is as easy as can be. Buy a package of frozen mixed berries. Add some to any kind of cool glass (I love these retro dot cups here). 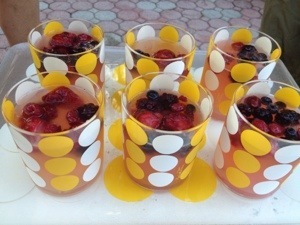 Fill the cup about half full with store bought lemonade then complete with sparkling white wine. I used Asti but you can use Prosecco or Champagne. Give this a try and you actually will enjoy your next party. Congratulations to Colleen Low Larkin who won the March Quick Bite Quick Sip contest. You have won a $25 gift certificate to the Lewiston Village Pub! Let’s keep the party going. April’s Quick Bite Quick Sip theme is Spring. Head out to your favorite eateries and hang outs and play.